Synopsis from Queens and Cowboys website: “QUEENS & COWBOYS: A Straight Year on the Gay Rodeo” chronicles a complete season of the International Gay Rodeo Association (IGRA). Roping and riding across North America, the IGRA’s courageous cowboys and cowgirls brave challenges both in and out of the arena on their quest to qualify for the World Finals at the end of the season. Along the way, they’ll bust every stereotype in the book. 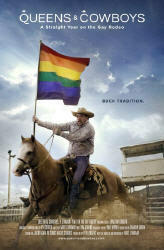 I saw this film at the Bloomington Pride Film Festival, and got to see one of the stars of this documentary, Wade Earp. He talked about some of his personal thoughts about the movie, IGRA, and his experiences. One of the main things he mentioned was that he wants “it to be about rodeo, not gay rodeo.” Eventually, we may get there, but until then there’s IGRA. IGRA was started for LGBT people so they can rodeo in a place where they are accepted. Many of the people in this film had experienced some type of discrimination or harassment in other rodeo settings. So this is a place where they can focus on rodeo without having to worry about the rest. Queens and Cowboys really tells a story about several specific people in IGRA, and it draws you into their lives and experiences. By the end, you find yourself rooting for certain people. Indeed, the whole audience was judging by the amount of applause! There are several prevalent themes in this film. One of the main ones is about acceptance and chosen family. When LGBT people have been ostracized by society and even their own biological families, we have created our own, chosen families. Many of these are more close-knit than those related by blood. You can easily see the family lines in the people of IGRA, and even how open and accepting they are of newcomers. If only all society was like this. Technically the film is very well done. Cinematography, music, story flow – all top notch. The film brings you right into these people’s lives and makes you feel like you are a part of it. It makes you think about your own life and experiences, and the lessons we can learn from these folks. There is a story that is told about hair that I will take with me into my own life. Overall, this film is very worth seeing to both learn something you didn’t know about IGRA as well as something about yourself.